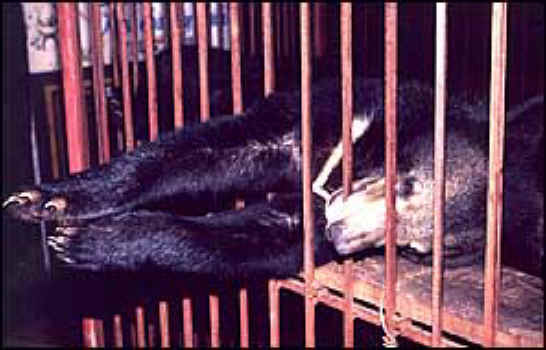 (Bear - Bile Farming - 20) This is a closer look at one of the Asiatic black moon bears languishing is a cage in a Vietnamese bile farm. Animals Asia reposts that: "Unlike China where bears are "tapped" for their bile, in Vietnam bears are victims of a variety of other cruel procedures. All are caged - some undergo crude surgery to remove bile from their gall bladders every three months which leaves agonizing, infected wounds and often leads to death after 3 or 4 such operations. 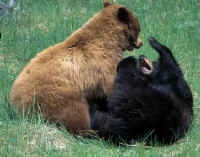 Other bears have their gall bladders punctured with long needles which then "siphon" off the bile via a pump into a glass bottle. Continuous puncturing of the gall bladder often leads to bile leakage and a slow and painful death from peritonitis."